Nuclear weapons: the biggest threat to global security? “Today, every inhabitant of this planet must contemplate the day when this planet may no longer be habitable,” former US President John F. Kennedy told the United Nations. It was 1961, the height of the Cold War and the arms race that accompanied it. More than 50 years later, and the spectre of nuclear holocaust that hung over the world for decades seems long gone. But some experts think that’s just a false sense of security. “The danger of nuclear weapons is greater today than it was during the Cold War, I believe that firmly,” William Perry, who once served as President Clinton’s defense secretary, warned just recently. An overstatement meant to shock or an accurate reflection of the current state of nuclear security? 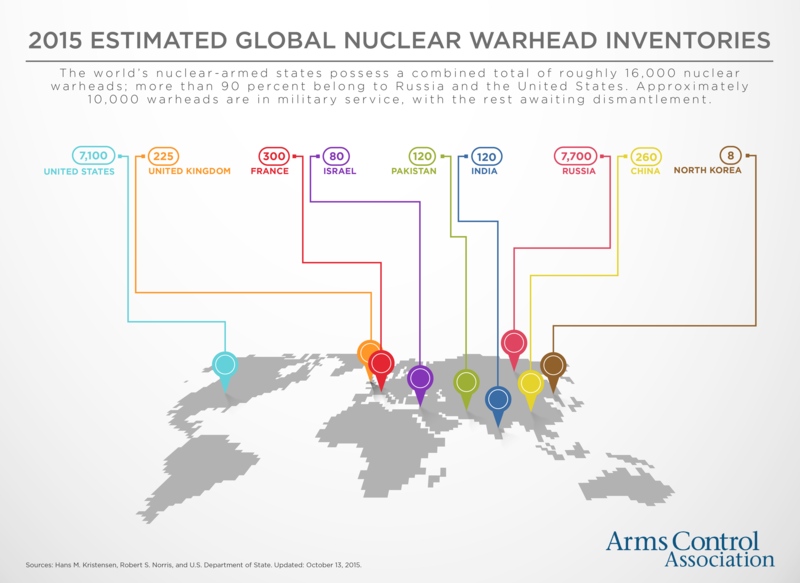 It might be six years since Russia and the US renewed a treaty aimed at limiting nuclear weapons, but as this infographic shows, they still possess thousands of nuclear warheads. Seven other countries are also known to have nuclear weapons. That includes four countries – Israel, India, Pakistan and North Korea – that have not signed the Nuclear Non-Proliferation Treaty, the ultimate goal of which is full nuclear disarmament. Between them, these seven countries possess around 16,000 nuclear warheads. It would take just a fraction of these weapons to inflict destruction on an unprecedented scale: “If these weapons were used even in a limited way, the result would be catastrophic nuclear devastation,” the Arms Control Association warns. But what makes the threat bigger than before is not just the nuclear weapons themselves: it’s the new world we live in. That’s what the Forum’s Global Agenda Council on Nuclear Security has warned in a whitepaper it hopes will make policy-makers aware of the “breadth, urgency, complexity and potential deleterious consequences of the multidimensional nuclear security challenges” we’re facing. So just what are these new threats that could see us heading for the nuclear bunkers? Members of the Global Agenda Council identified three separate causes. When a US presidential candidate is making headlines for refusing to rule out the use of nuclear weapons against Europe, you know that the geopolitical order is undergoing big changes. While this scenario seems very unlikely to lead to a nuclear war, the whitepaper drew on other examples that “could occur in the next 6 to 24 months”. These included a further breakdown in relations between Russia and neighbouring NATO states, a crisis in the Western Pacific between China and Japan, and nuclear proliferation across the Middle East. You might think of technological innovation as designed to improve our lives. But it does have a darker side. “Emerging technologies – those commercially available or for advanced military use – are amplifying threats to nuclear and geopolitical crisis stability,” the council writes. These technologies could be as simple as the cyberattacks we hear about on an almost daily basis. By using such an attack to “spoof” a nuclear state into believing a nuclear strike has been launched against it, hackers could push a country into launching a “retaliatory” strike. More sophisticated technologies also pose a threat. For example, drones armed with explosives could be used to target spent fuel pools, “creating a significant radiological effect”. What’s more worrying is that many of these technologies are becoming democratized: “Many emerging technologies, such as cyber-technologies and cyber know-how, are increasingly commercially available or available to non-state actors.” Which brings us to the final, and perhaps most worrying, of the three causes. Mutually assured destruction: no longer a deterrent? For all the fears of a full-blown nuclear conflict throughout the Cold War, the concept of mutually assured destruction was oddly reassuring: “If the other side knew that initiating a nuclear strike would also inevitably lead to their own destruction, they would be irrational to press the button,” Tom de Castella of the BBC explains. That makes sense when rational people have their finger on the button. But that might no longer be the case. After March’s terrorist attacks in Belgium, the government evacuated the country’s nuclear facilities, for fear that Islamic militants might attempt to acquire radioactive material. When the enemy is no longer concerned about its own survival, the stakes get a lot higher: “The broader narrative of ISIS leveraging its wealth to capitalize on ideological sympathy in current or future nuclear states is plausible, especially in an environment of nuclear proliferation with more nuclear actors,” the Forum’s whitepaper warns. The World Economic Forum's Global Agenda Council report on nuclear security is available here. Are these the next global conflicts?